The majority of owl species are nocturnal, meaning they sleep during the day and are awake and hunt at night. However, this does not hold true for all owls, as some do hunt and consume their prey during daylight hours. Snowy owls, for example, hunt during the day, as they tend to live in climates with long hours of sunlight, and Barred owls will hunt during overcast weather, as well as at dawn and dusk. Owls have exceptional hearing and can use their auditory advantage to locate prey in the dark. While most birds have small, circular ear openings, the owl has two vertical slits in its skull, one often higher than the other. This unique design allows an owl to determine both the distance and direction sounds are coming from, allowing it to effectively zero in on prey. Owls have large eyes, binocular vision and exceptional depth perception, which gives them an added advantage in limited light conditions. Even though they have a narrow field of vision, their ability to rotate their heads compensates for it. Since owls must turn their heads rather than move their eyes to look directly at something, the cover of night also helps conceal their movements. Owls generally eat a diet comprised of rodents such as voles, squirrels, rabbits and mice, many of which are also nocturnal and come out only at night. 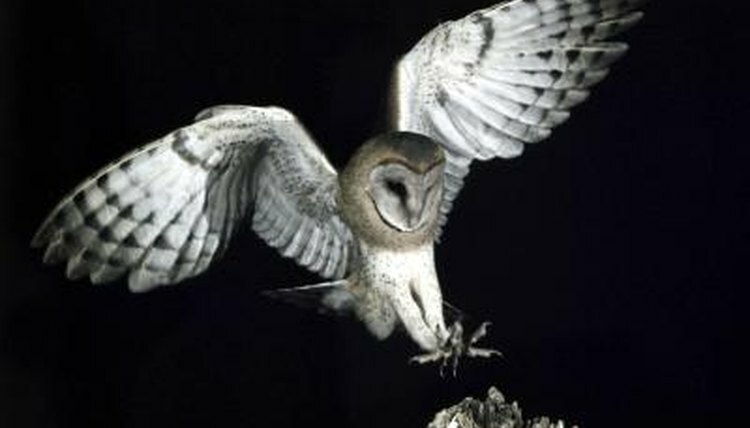 Because prey is more readily available during the nighttime hours, this is when most owls find a fast and suitable meal. Owls that hunt during the day are large members of the species, and don't face as much competition from other birds of prey. Their larger mass also allows them to hunt bigger prey that's active during the day. Snowy owls often favor ducks, while Barred owls hunt animals as large as foxes. Many owls stake out a territory and become intimately familiar with its terrain. An owl is able to navigate this landscape, even in darkness, giving it another nighttime hunting advantage. The owl comes to anticipate the regular movement of prey and stakes out perches and other hunting spots accordingly.